No matter how well you plan, life is busy! Absolutely no doubt about it. This Easy Taco Pasta Salad is a complete meal that can be pulled together in less than thirty minutes. It is so delicious and with the use of romaine lettuce leftovers hold up well. It is a complete meal in itself and perfect for those warm summer nights when you don’t want to turn on the oven or venture out to grill something. What is the best pasta to use for Easy Taco Pasta Salad Recipe? I think that Radiatore pasta is the best with this dish. It is just the right size and it has lots of nooks and crannies for the dressing. However any small pasta will work as well such as macaroni, rotini, small shells, or bowtie pasta. 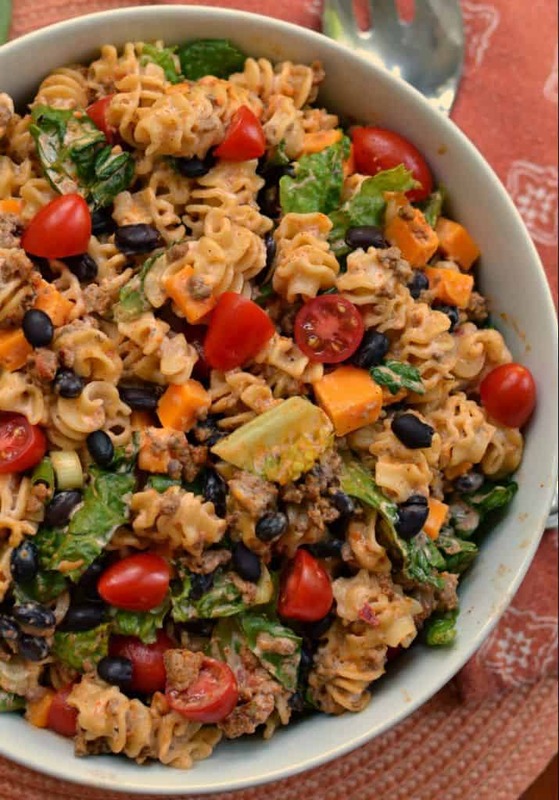 How far in advance can you make Easy Taco Pasta Salad? You can make this pasta salad up to two days in advance but I would not add the romaine until a few hours before. You want your lettuce to be fresh and crisp. Store in an airtight container in the refrigerator. If the pasta salad seems dry add a few tablespoons of ranch, sour cream or salsa. How do you make Taco Pasta Salad? It does not get much easier than this. Simply cook your noodles and drain well. Next brown the ground beef and drain any excess grease. Then add the taco seasoning, water and simmer. Remove from the heat and allow to cool to almost room temperature. In a small bowl whisk together all the dressing ingredients. 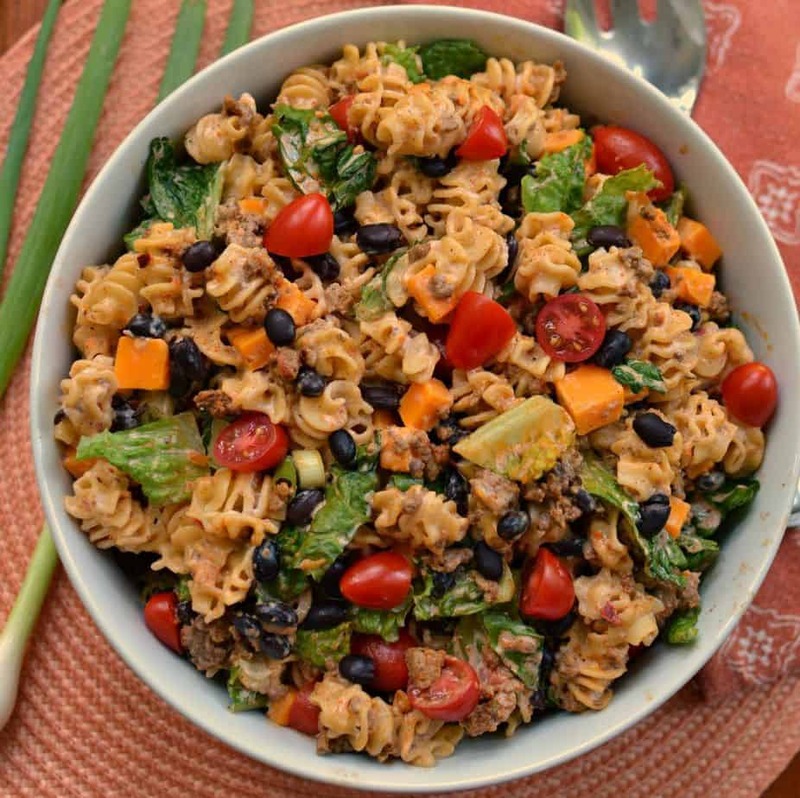 Grab a large serving bowl and gently combine the cooled pasta, prepared dressing, seasoned beef, cheddar, tomatoes, scallions, black beans and romaine. My family loves a good pasta salad! They are great for a late Saturday or Sunday lunch. Do you love pasta salads? 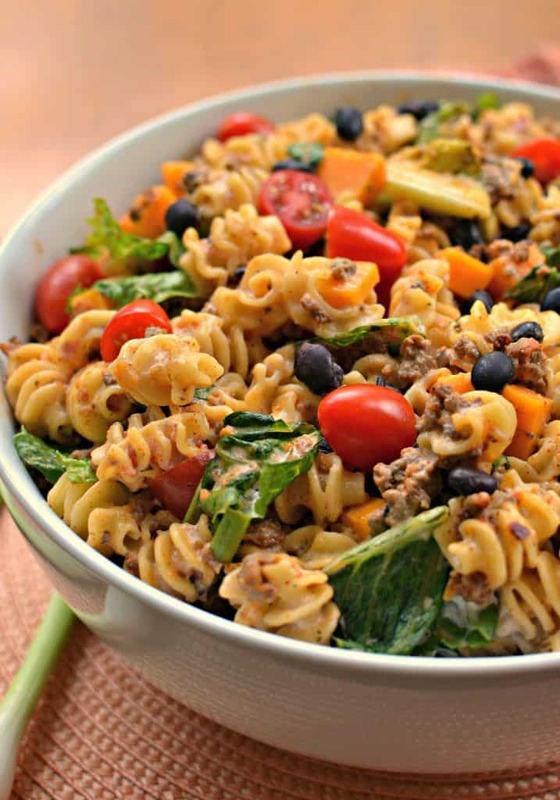 Here are some other scrumptious pasta salad recipes. Everyone could use a few more great pasta salads!! Cook the pasta slightly al dente. No one wants mushy noodles and pasta salads require stirring so you don’t want those noodles breaking down. Include lots of good quality fresh ingredients. Look for the best grape tomatoes, sharp cheddar, romaine lettuce etc. Let the noodles cool before adding the romaine lettuce and other ingredients that like to be cool. They are now selling ranch dressings in the refrigerator section that have no artificial flavors, preservative or colors and they are delicious! If your pasta salad seems dryer than you like it add a few tablespoons of extra ranch, sour cream or salsa. Most pasta salad recipes are easily modified with a little of this and a little of that. 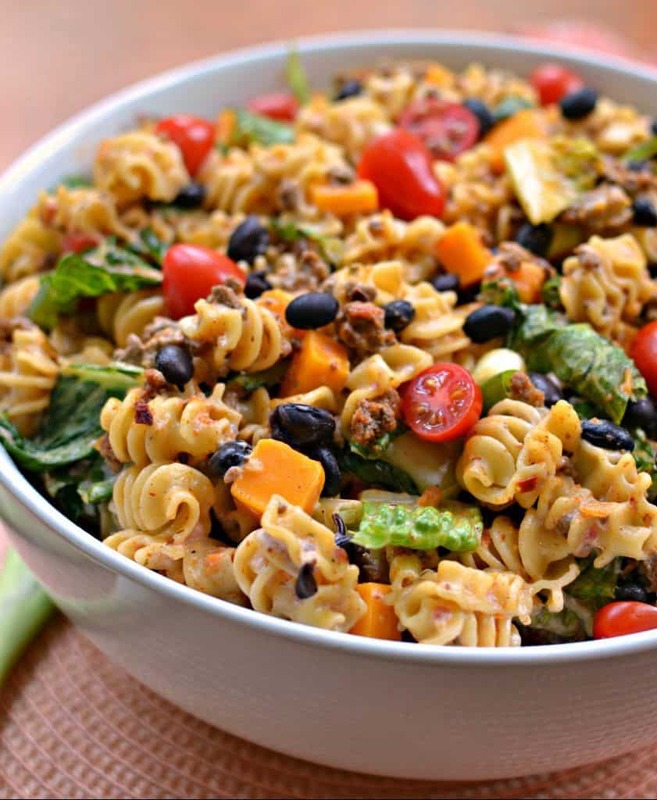 Put the ingredients for this amazing Easy Taco Pasta Salad on your shopping list today and prepare you and your loved ones a delectable wholesome summer meal that you can feel good about. This post was originally published June 11, 2018 and was republished February 7, 2019 with new content. More pasta salads you will love! 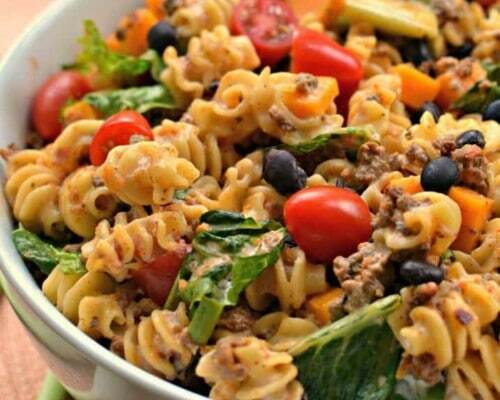 Easy Taco Pasta Salad brings taco seasoned ground beef, pasta, tomatoes, black beans, cheddar and scallions into a creamy slightly spicy ranch dressing. Cook pasta la dente according to box instructions. Drain well and cool. Stir or flip while cooling so it does not stick too much. In large skillet over medium heat brown ground beef. Drain any excess fat. Turn heat to low and add taco seasoning and water. Simmer for 7-10 minutes. In small bowl whisk together ranch dressing, adobo sauce, sour cream and salsa. Add cooled pasta to large bowl. Add mixed dressing, cheddar, tomatoes, scallions, black beans, romaine and seasoned beef. Stir gently to coat and serve. You can use any small pasta for this dish like small shells, macaroni, rotini or bowtie pasta. Adobo sauce can be made homemade or purchased in the Mexican section of your grocery store. You can also but a can of chipotle peppers packed in adobo sauce and use the pepper for other recipes. Canned chili peppers that have been continuously refrigerated will keep for about 1 to 2 months.